Happy Thanksgiving to our American readers! Today, instead of sharing a story about the Pilgrims, Native North Americans, or the very first Thanksgiving, I wanted to review a story that is all about gratitude. That's what this lovely holiday celebrates--thankfulness. 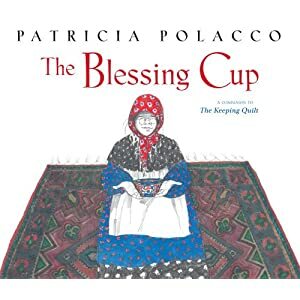 The Blessing Cup by Patricia Polacco is the perfect picture book in the gratitude department. This book is the true story of the author's grandma Anna, when she was a little girl living in a Jewish community in Russia. Her family is content; money is tight but they have each other, and they have their community. Anna's mother's prized possession is a beautiful tea set that is worth a small fortune, given to her as a wedding gift. A prayerful tradition of thankfulness to God, and to each other for their simple life is offered up each night when the family shares tea together. When the Jews are expelled from Russia, Anna and her family must find refuge elsewhere, her father becomes sick. They find a doctor who is kind to them, lets the family stay in his house and nurses the father back to health. That's all I can tell you about this children's picture-book memoir without giving the ending away. It's a beautiful story, both in illustration with black and white pencil drawings with small wisps of color, and in words. This book will give you a heaping dose of gratitude, and perhaps a lump in your throat towards the end. I highly recommend reading The Blessing Cup over Thanksgiving weekend, counting your own blessings, and being with those you love.